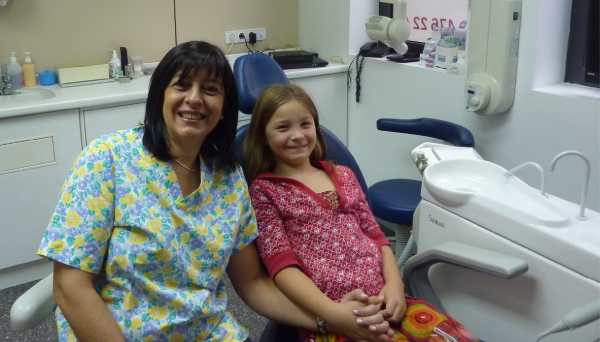 Paediatric dentistry is the branch of odontology that specialises in the dental care of children. Establishing good habits of oral hygiene at an early age is the first step towards maintaining a healthy mouth throughout your life. As soon as the first baby teeth come out it is time to start using a toothbrush, but without any toothpaste though, this should not be used before two years of age. The first visit to the dentist should be made between 30 months and three years. The dentist shall examine the teeth, gums, and jaws to evaluate the correct development of all the structures, assess habits and teach the correct way to clean and care for the teeth. Of all the age groups, children are generally the group at higher risk of presenting cavities, since they tend to eat more frequently and are not yet proficient at brushing. It is important to awaken motivation and enthusiasm for their toothcare. Up to the age of three the parents are in charge of brushing their childrens’ teeth, and from then on they can do it on their own, but always under adult supervision. This brushing surveillance should go on until the age of 8. Around the age of three, most children already have all their primary teeth, also called milk teeth. They are a total of 20, and although they will all end up being replaced by permanent teeth, they have to be properly cared for; cavities should be detected and filled adequately. Good care for the gums to avoid any gingivitis is also important. We also keep in mind other preventive material that can be applied in children, like pit and fissure sealers or sealants. These materials are resins that can be applied on the tooth’s chewing surfaces, to reduce the probabilities of cavities, as they transform the pits and fissures into smooth surfaces that are more easily cleaned. They are usually applied in children aged 6 to 7, when the definitive teething begins. It is a simple procedure that does not damage the enamel nor requires anaesthetics. It is capital that the child is taken to the dentist for prevention, so that they become familiar with the clinic in a natural way that generates trust.